Battery Care - AutoSys Inc. Even if you have the most meticulously maintained vehicle on the road, without a well maintained battery, your vehicle may not start or even allow you access to the vehicle. From power door locks to auto start systems, today’s vehicles rely on correct voltage and clean connections to allow today’s technology dependent vehicles to perform and take you to your destination. When your car’s engine is off, the battery provides the required power to the rest of the system, as well as during start-up (cranking). It also supplements the power from the charging system during periods of high demand. Composed of a series of lead plates submerged in a 35% sulfuric acid/65% water solution, your 12-volt battery houses a chemical reaction that releases electrons through conductors, producing electricity which is then channeled into your vehicle’s electrical system. The charging system is the life force of your vehicle’s electrical system, It consists of three main components: the belt-driven alternator, various electrical circuits, and a voltage regulator. 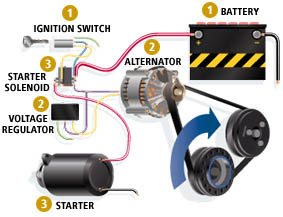 The alternator supplies power to the electrical system and recharges the battery after your car has started. Just like it sounds, the voltage regulator controls the voltage, keeping it within the operating range of the electrical system. This system consumes more electrical power than any other component in your car. The starting system consists of three components which work in tandem: the ignition switch, the starter relay or solenoid, and the starter motor. The ignition switch controls the starter solenoid, which activates the starter motor. The starter motor then turns the engine until your car starts.